procedures that suit your concern...Click below to learn more! The Arasys inch-loss system is like doing exercise without having to go through the hassle of actually doing it. Past devices that claimed to stimulate muscles used electrical current to jerk and twitch them. The Arasys inch-loss system does not target the muscles themselves but the nerves that control the muscles. Using waveforms that resonate your brain’s own bio-electric signal, your body mimics the clean contraction you get during exercise. The benefit of Arasys is that your muscles don’t become overstressed because Arasys burns fat without depleting glucose. Afterwards, your muscles are not sore or fatigued. A 17-minute Arasys treatment has the same effect as 300 sit-ups and 400 buttock raises. Typical inch loss can range from 2-6 inches. The Arasys system also helps speeds your metabolism, restores elasticity of your connective tissue, increases oxygenation and blood circulation, reduces cellulite, builds muscles, and boosts performance. Arasys has also been used to alleviate muscle pain and atrophy. Created by Gerry Pollock, co-inventor of the pacemaker, the Arasys was originally designed to help those with MS. It proved so effective at tightening skin that all kinds of medical professionals use the Arasys inch-loss system for various clinical purposes: medical spas for inch loss and cellulite removal, gynecologists to tighten abs after pregnancy, and plastic surgeons can use it to tighten skin after a liposuction. Arasys inch-loss system is safe, non-invasive, with no trauma on the muscles, and zero side effects. 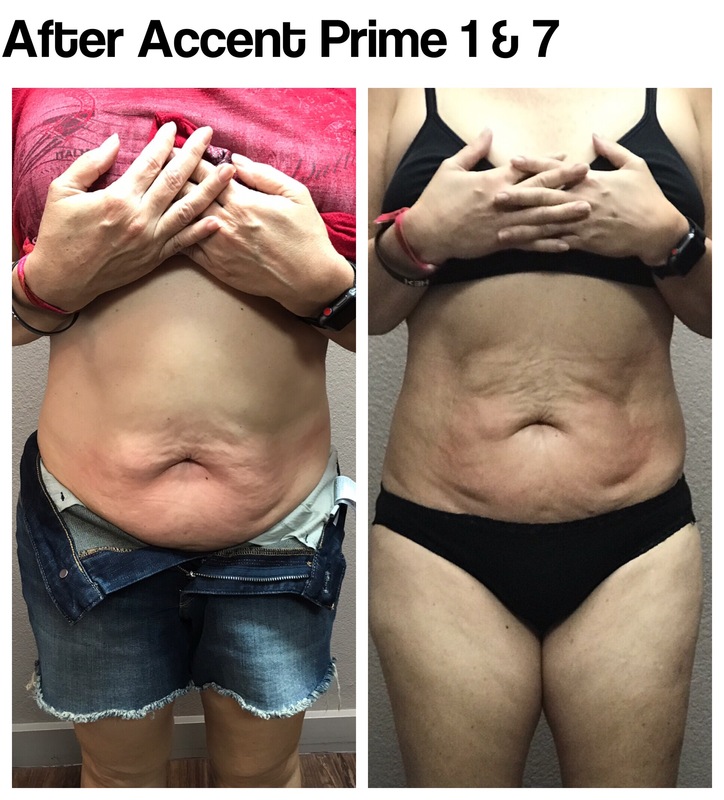 Accent Prime for the body features patented ultrasound process that selectively target fat cells, while leaving surrounding tissue unharmed. The ultrasound energy is distributed evenly to deliver effective, customized treatments and long lasting results. The ultrasound energy distributes acoustic vibrations to the layers of adipose (fat) tissue destroying the cellular membranes of the fat cells, leading to a breakdown and release of stored fat. Damaged fat cells are then excreted by your lymphatic system. Accent Prime RF device is then used to produce deep thermal heating to the tissue. This results in a tightening for the skin. We recommend a total of 5 treatments done weekly or bi-monthly.